Learn how to easily import forms, entries, and Views on the 'Formidable' → 'Import/Export' page. If an imported form, entry, or View matches the key and creation date of an existing form, entry, or View, the existing item will be updated. Follow the instructions below to import forms, entries, and/or Views as an XML file. If your imported form/entry/View/Style key and creation date match an item on your site, that item will be updated. You cannot undo this action. Go to your 'Formidable' → 'Import/Export' page. In the Import section, select an XML file to upload. Click Upload File and Import. Your form, entries, View and/or Style will be imported or updated. 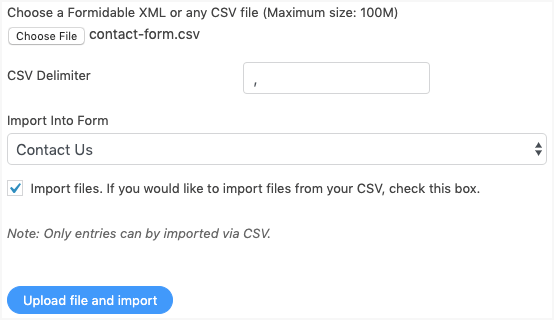 Follow the instructions below to import entries into a Formidable form as a CSV file. "First name", "Last name", "Address", "Phone number"
"John", "Doe", "123 Main St.", "123-123-1234"
"Jane", "Smith", "789 Center", "321-123-1234"
Note: If you are a Mac user, you will need to save your file as Windows Comma Separated (.csv). Go to 'Formidable' → 'Import/Export' and select a CSV file to upload. Select your delimiter (often a comma) and the form where you would like to import the entries. In the Map Fields section, you will see a column for the headers in your CSV, one for sample data from your CSV, and one for selecting which fields the CSV columns will go into. Map each column to the corresponding field. If you would like to update existing entries instead of importing new entries, you must map the Entry ID field to an Entry ID column in your CSV. If the entry ID in the CSV matches an entry ID in the form, the entry will be updated. Otherwise, a new entry will be created. Click the Import button, and watch the number of entries to be imported count down. 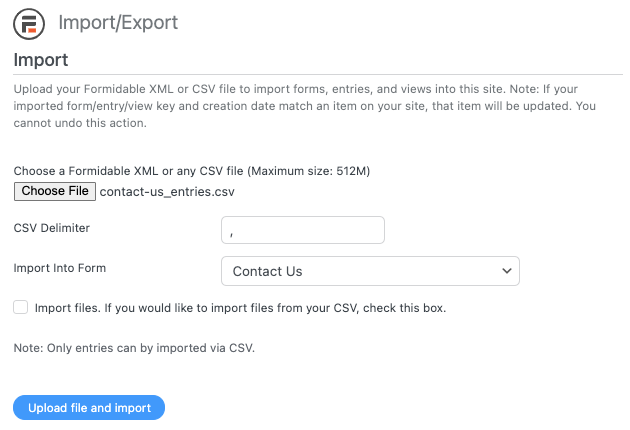 If you have trouble importing your CSV, please go through the import troubleshooting steps. Note: Currently, importing Repeater data via CSV isn't supported. You can import entries with Repeater data via XML. 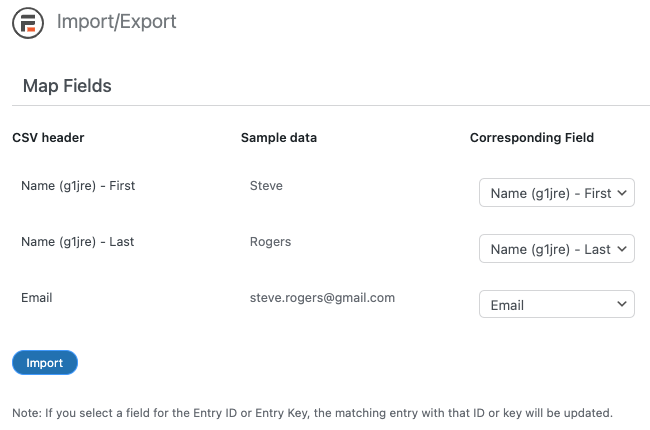 To assign an imported entry to a specific user, include a column in the CSV to match up with the user id field. This column will link users by the assigned WordPress user ID, non-numeric login, or email address. A numeric login will not link to the correct user, since this number is assumed to be the user ID. If the user does not yet exist on your site, learn more about how to import users. When you import a CSV of entries, include a column that holds the entry id. Then when importing, map this column to the ID near the bottom of the page. Now, the matching entries will be updated with the details included in the CSV. If you want to export a Style from one site to another, just export the Style then import the XML file onto the desired site. When you import this XML file onto another site, the form and attached Style will be imported. The imported style will be added to your 'Formidable' → 'Styles'. If you would like to import files from entries on one site into entries on another site, follow the instructions below. Please note, you cannot import files that are protected. For more information about File Protection, click here. Go to 'Formidable' → 'Import/Export'. Under 'Import' click Browse and select the file you want to import. The file must be a CSV file. XML files cannot import uploaded files from entries on another site. Click Upload files and import. Disable everything else (plugins and theme) on the site you are exporting from and export again. Open the XML in a text editor and remove the extra space manually. Once you have a correctly formatted XML file, you can import it again. Why won't a CSV file import correctly?